Things needed for assembling the sandwich? 2. Add the mashed potato and add the garam Masala powder and red chilli powder. 3. Give a nice toss until well blended. 4. Now crushed coriander seeds. 1. Blend everything in the blender using little water to make thick paste. 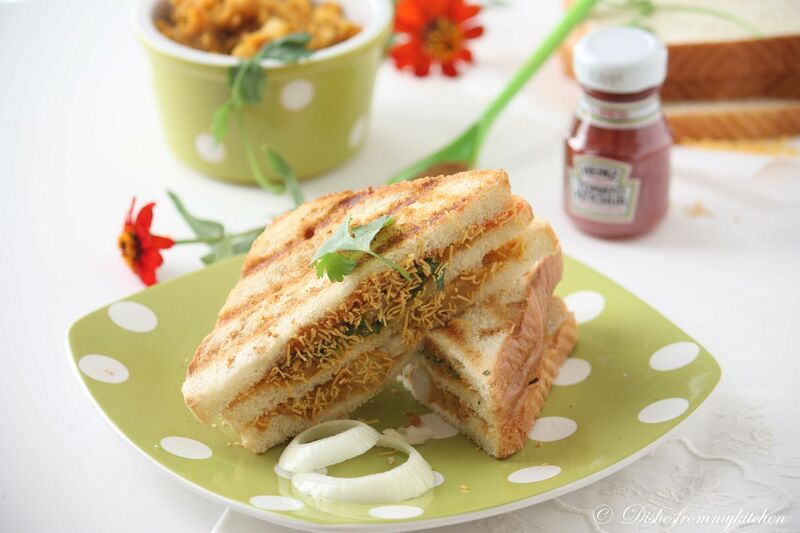 You can refrigerate the extra chutney in the fridge for 7 days. 1. Grill 3 the bread by applying little butter or spraying little oil nice and crisp. 2. 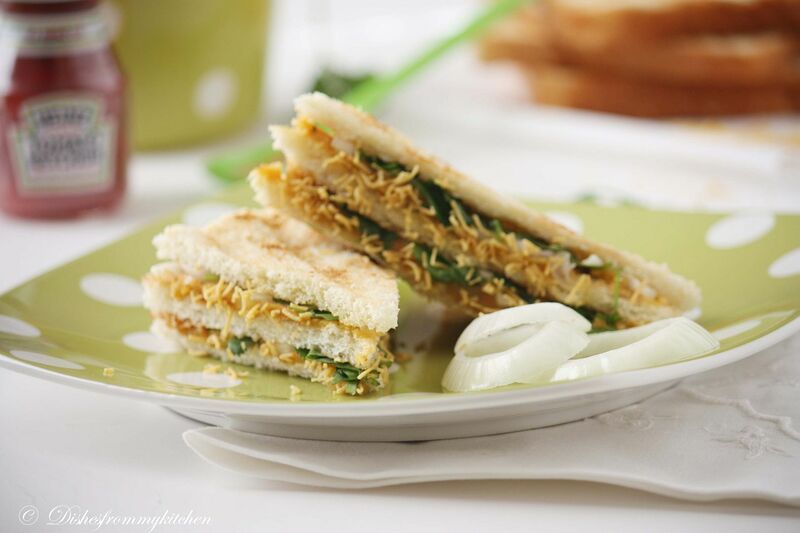 Apply bread with the thin layer of potato filling, sprinkle some finely chopped onion. Sprinkle some Sev/Ompodi followed with Coriander leaves. Squeeze some Ketchup. 3. Top with other bread and follow the same 2nd point again. 4. 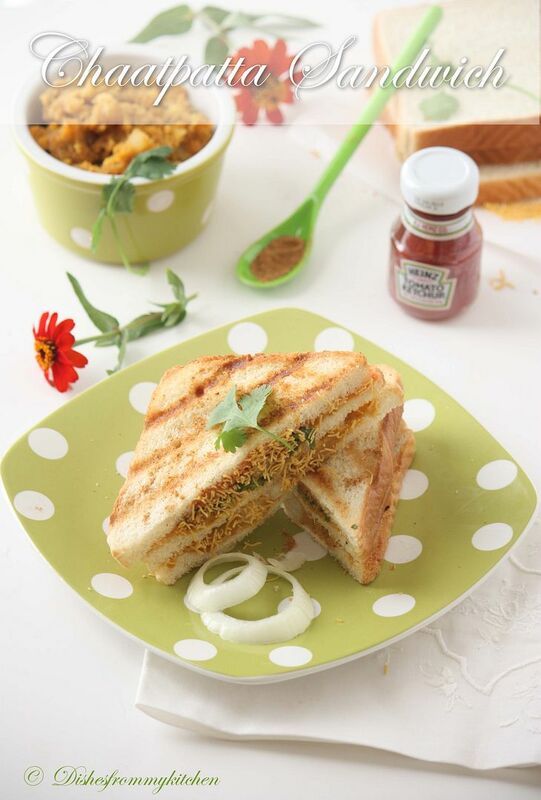 Take one more bread apply the Mint Chutney. Close the second bread. 5. Grill it again just for a couple of second as the onion and coriander should not be cooked. 6. Take it out cut to into 2 triangles; serve it by sprinkling some chaat masala. 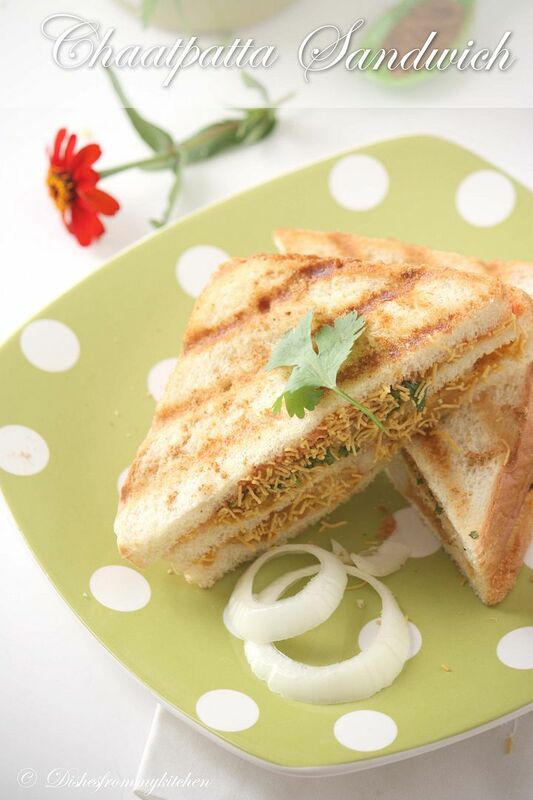 Enjoy the Chaatpatta Sandwich with tea, coffee, as a breakfast or as a Dinner. Either way it is yumm!!! That's a quick and yummy snack dear. Omg, thats a super delicious and irresistible sandwich,makes me drool. It looks really chatpata !!! Delicious snack!! and more delicious pics ! Whoa that's a decadent sandwich pavi. It's full of aroma all the way n healthy as well. These sandwiches are calling my name! I could have one right now :) They look crunchy and delicious! My fav too, the pics are gorgeous n very inviting! Sandwich looks so very tempting. Very interesting sandwich idea. Love that you have used regular bread and created a chat like taste to it. Awesome idea pavi! I would love to try this way! 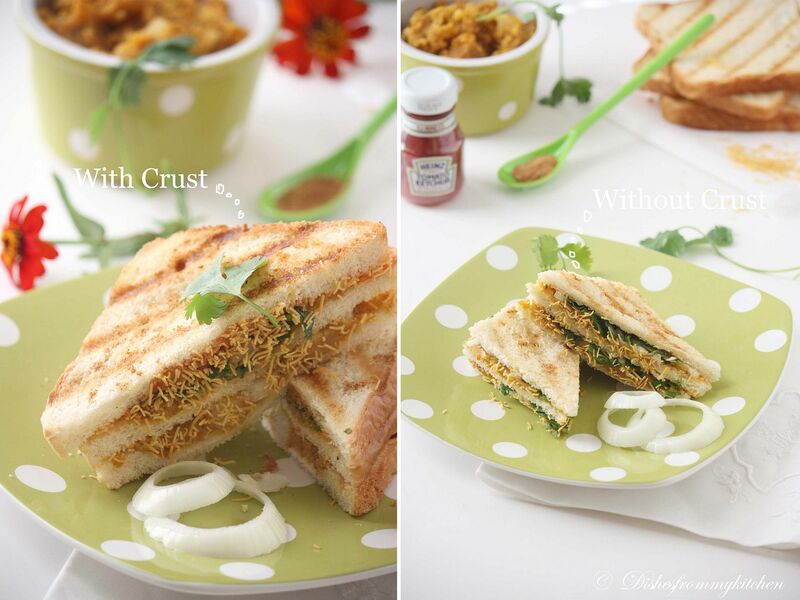 this is like a samosa sandwich! love the idea! Great idea for a sandwich, looks delicious! Lovely Sandwich they look so mouthwatering! Chatpata & yummyyyy!!!! Tongue tickling flavors..Just wanna grab the sandwich & bite into it! !